I have two groups of texts that are very similar (e.g. reviews written on fridays and reviews written on mondays), and I want to build a LSTM that can classify them into positive and negative reviews. The question is then how to input the categories (Monday/Sunday) such that the model also takes those into account. 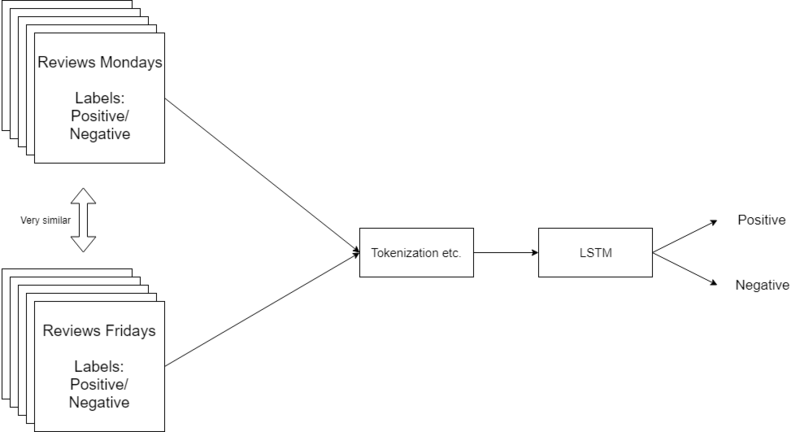 Add a variable to the start of the tokenized texts (0 and 1 for the Friday/Monday). This will likely have very little impacts due to their small weight in the entire context of the LSTM. Just hope that the network finds out itself (should one balance the categories friday/monday and the categories positive/negative for each?). It is quite simple in most other non-sequential models, as one e.g. with a bag-of-words and random forest just could force the dummy variable to be in all trees, or one could normalize the variables, such that the variable would have a weight just as high, as all the text combinedly. Browse other questions tagged classification deep-learning lstm categorical-encoding sequential-analysis or ask your own question. How do you encode relationships between High-Cardinality, Categorical features?